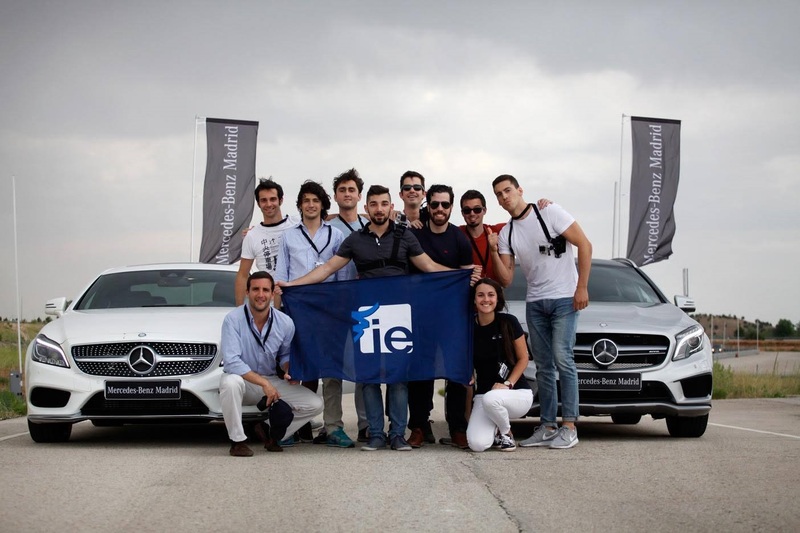 On 9th of June, Instituto de Empresa Motor Club together with Mercedes-Benz organized the Dream Cars event. This is the first time an event of such characteristics is organized for a business school / college; Mercedes-Benz offered the opportunity to 40 students from different masters of IE Business School (MIM, MIF, IMBA, EMBA, etc. ) to attend the facilities of INTA (National Institute of Aerospace Technology) to see firsthand the great performance that the AMG models can offer. A bus picked us right after finishing our classes in IE and took us to the facilities of INTA. There we were greeted with a catering / cocktail followed by a delicious meal. Then an IE alumni currently working in Mercedes-Benz gave the welcome speech and explained briefly what activities they had prepared for us. 4. Mickey Mouse (short circuit ability delimited with cones) and slide braking zone to test electronic security systems. After the event we were presented each with a pole of Mercedes-Benz Madrid and a keychain of the beautiful model sl300. An experience that all participants would definitely repeat (maybe next time being a proud owner of a Mercedes-Benz).